Considering a Church Website Redesign? Are you thinking about having a church website redesign done? If you're on the fence, here are some things to consider that might help you decide whether or not to move forward with it. Why do you have a website? Did you have goals for your website when it was created, and if so, is it meeting those goals? This is a great place to start. Some common goals of a church website are to bring in new visitors to your church or to keep the congregation informed of what is going on during the week. Other goals might include having a place to present your Sunday messages to the world. Whatever your particular goals are, is your website currently meeting those? If not, it's time to recognize that and do something about it. Maybe your goals have changed since you had the website created. Maybe you have the same goals but are now realizing they have not been met. Whichever the case, it may be time to redesign your website. We have to face the fact that your church will be judged on the look and feel of your website. That is how it is today. If the style of your website is clearly dated, it's time for a redesign. 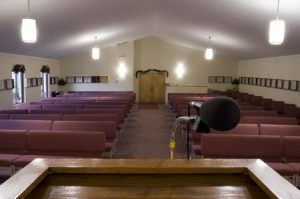 People look for a church that is active and relevant to today's society. If they come upon your website and it has a look that was in style ten or more years ago, they will probably click out and go on to another church's website. You obviously don't want that to happen. Remember the styles of carpeting and linoleum from past decades? Or the flowered wallpaper covering all the walls in a house? If you are trying to sell your house and you have some of these styles still in it, you will want to update it before putting it on the market. Otherwise, you may lose potential buyers. It works on the same idea with your church website. Here is an article that gives five ways you can quickly tell if a website is dated. There are more things to consider but it's a good start. They note that having lots of colors on your site as well as animated images are sure signs of a dated look. There are some other things you can consider like generic fonts that might also call for a redesign. This is not to say that you need to redesign your website every year, but it is important to stay current with the times. If your website hasn't been redesigned in several years, it may be time. Is Your Church Website Mobile Responsive? This is HUGE today. Mobile device usage continues to grow so it is reasonable to assume people are searching for churches to visit on their phones or tablets. If your site doesn't look good or gets cut off on a mobile device, you will lose those potential visitors. 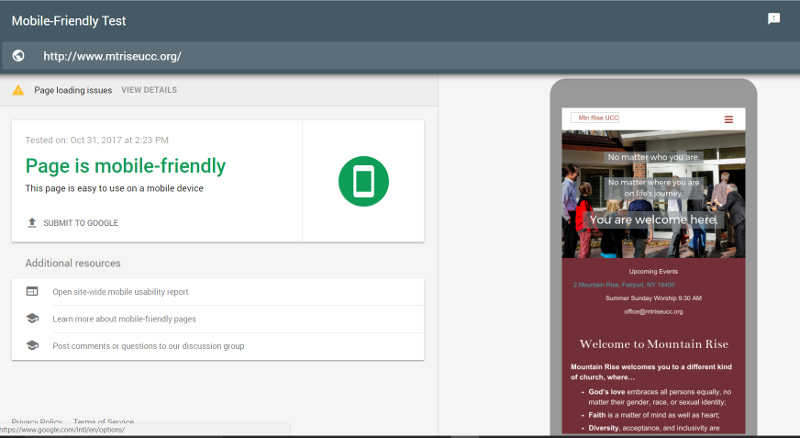 If you are not sure if your website is mobile friendly, you can check it out at https://search.google.com/test/mobile-friendly. You will need to put in the url of your website and then Google runs a test to see how well the website fared. Here is the screenshot of the test run on a local church website that we designed, and this is the type of result you want to see. Having a mobile friendly website is only going to be become more essential as time goes on, so don't put it off. The young adults are especially using their phones to do internet searches, but it's also becoming more common for older folks as well. Does your current church website have a good, easy to follow navigation system? When people visit your website, they will be looking for specific information, and if they cannot find it readily, off they go. 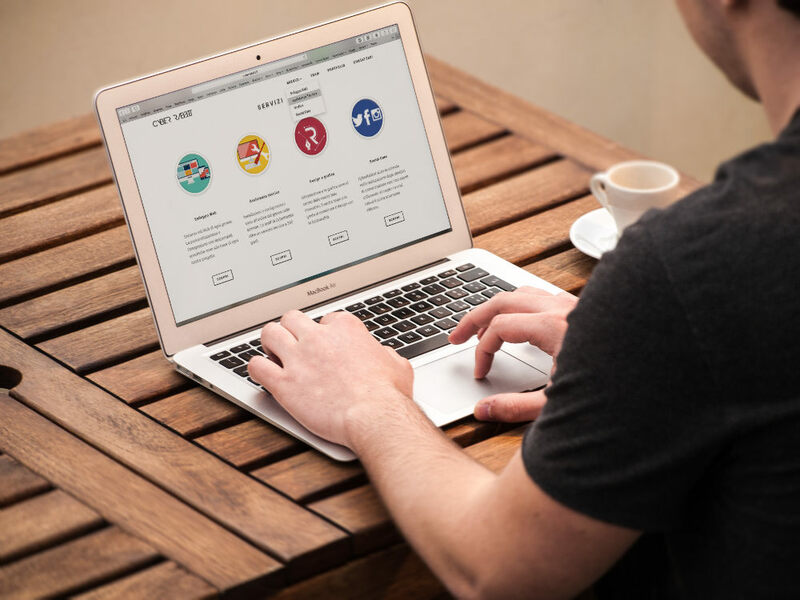 An article written by the Holt Partnership states that you have about 15 seconds to get a web visitor's attention and present the information they want. So, it follows that your website's navigation needs to quickly lead your visitors to what they want to know. We normally recommend that you show the most popular topics on the top level navigation and then use dropdowns to present additional choices under the appropriate category. What is Stopping You from a Church Website Redesign? If you are starting to acknowledge that it may be time for a church website redesign, what is stopping you? Is it the cost or the time and effort it takes? Is it that you don't know anyone you can trust to build you a new website? Maybe it's that you don't want to hurt the feelings of whoever designed the last website, especially if they are a member of your congregation. None of these should stop you. The last one is a little hard to get over, but if your website is hurting the health of your church, it's time to move ahead. We would love to help! We offer affordable church website pricing and are experienced in church website design. Why not give us a call at 800-615-8606 so we can talk and answer any questions you have? We'll put your mind at ease!